Slow roasted meats such as beef or pork in a rich wine sauce are a perfect accompaniment for pasta…even better still when the meat is game. Preheat the oven to 150°C. Heat the oil in an ovenproof, heavy-based pan or casserole set over a low-medium heat. Add the onion, carrot, celery, garlic and bay leaf. Season the flour with salt and pepper. Lightly coat the wild boar in the seasoned flour. Add some olive oil to a separate pan set over a high heat and add the wild boar pieces. Fry until the meat is golden-brown on all over – this may have to be done in batches to avoid crowding the pan. When the vegetables have softened, add the pancetta, bay leaf and orange rind to the pan. Cook for about five minutes until much of the pancetta fat has rendered and the vegetables have browned a little around the edges. Add the browned boar meat to the vegetables. Pour the red wine into the frying pan used to brown the meat. Cook over a medium heat, scraping the bottom of the pan to loosen any charred bits of meat. Add the tomato purée to the ragú and stir it through. Cook for two minutes stirring regularly to avoid burning. Pour the warm wine into the ragú, add 200ml water and bring to a simmer. Add the oregano leaves and stir through. Put the lid on the pan and place in the preheated oven for 1½ hours, or until the meat is meltingly tender and the liquid reduced. Check once or twice in this time and stir to prevent the meat on the surface drying out. 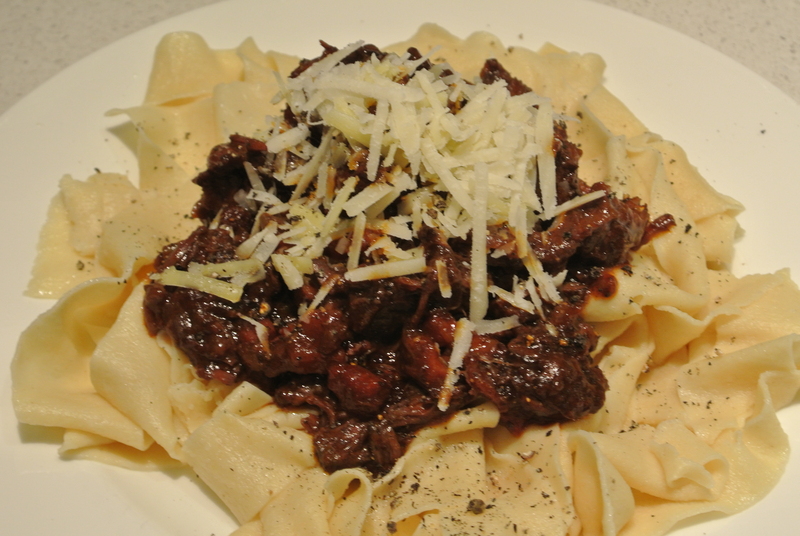 Use Beef braising steak, but cook for at least 2 hours, or even Ox cheeks and cook for at least 3 hours.